BT Cellnet are taking money from the credit card accounts of thousands of innocent people... ...even though they haven't got a Cellnet phone! This page illustrates our media exposure of the Cellnet credit card fraud scandal. Our web campaign directly prompted several TV and radio programmes, and at least a dozen newspaper and magazine articles (one of them simply about the effectiveness of web campaigns!). It is organised in reverse chronological order (most recent stories at the top). There's a quick summary of the problem on our précis page. I'd like to thank all those who have taken the trouble to contact us, and especially those who've kindly agreed to pass on their experiences to the media to support the campaign. A note for journalists: several articles and programmes in the printed and broadcast media have been prompted by, or benefited from, visits to this website. By all means use its content as a resource, but it would be a courtesy to advise us of your publication / broadcast and date. Thank you! The Bradford Telegraph & Argus published an article (Saturday 2. June 2001, Page 5) about a phone swindler who was given nine months for fraud. "A 20-year-old man involved in a mobile-phone scam has been locked up in a young offenders' institution for nine months. "Judge Geffrey [sic] Kamil requested that details of how the scam worked should not be published. But Bradford Crown Court heard the scheme involved the use of stolen details of credit cards to obtain free mobile-phone air-time with providers such as Vodafone and BT. Prosecutor David McGonigal explained that investigators contacted police in Bradford after they noticed a high incidence of mobile-phone fraud in the area". "Judge Kamil said 'I have to take the view that this is an extremely serious type of offence and one whereby there has to be a deterrent element in the sentence I have to impose'." You can read an electronic version of the background story on the BT&A's website. Although their story refers to criminals using a card scanner, there's actually no need for this, as all the numbers you need are in plain view on the card, anyway. "Richard Tyson-Davis, of the Association for Payment Clearing Services, which looks after the automated transfer of funds on behalf of the big banks, told me the problem was 'on the decline'. But BT Cellnet � identified by Mr Tyson-Davis as one of the most problematic networks � does admit the scam is rampant in Bradford at the moment". So, what will APACS do about it? I wrote to them on 27. July 1999 with full details of the Cellnet scam, and never even received an acknowledgement. "I was amazed that One2One should allow telephone credits to be bought in this way. You just punch in a credit card number - no signature or authorisation is required. "It's not hard to find credit card numbers and expiry dates belonging to other people. You need only search through any bin outside a restaurant or supermarket for discarded till receipts with all the details. Which is why mobile phone companies shouldn't allow fraudulent payments to be so simple". "Neither One2One nor BT Cellnet could bring itself to comment this week, but a quick search of the internet reveals just how widespread this problem has become. 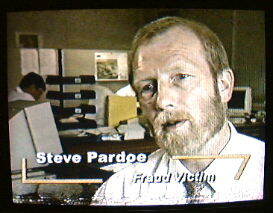 A website set up by Steve Pardoe, a victim of the same fraud, at www.pardoes.com/cellnet is full of messages from people who have encountered the same problem". We've already had several new messages from victims who've seen the article, which is available on the Telegraph website, and has a link to this one. 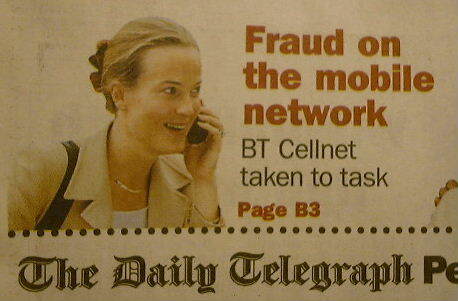 A previous telegraph article which was devoted to our campaign against BT Cellnet fraud is referred to below. In the Sunday Times of 8. April, the lead story in "Money Matters" (page 4.2) was headlined "BT Cellnet's free offer comes with bills attached" in which Diana Wright described BT Cellnet's leaflet offering a "free" phone to its shareholders as "the most misleading bit of bumf I have seen for some time". You can read the full article on the Sunday Times website (follow the "Money" button in the navigation panel). What is it with BT Cellnet ; are they completely incapable of telling right from wrong? After research through this website, the January edition of the Consumers' Association magazine "Which?" 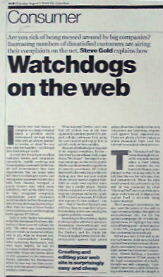 carried an "Inside Story" article about BT Cellnet's security, drawing attention to problems with credit card top-ups. In addition to Cellnet's third-party fraud, which is the basis of our campaign, "Which?" reports that, according to BT, if an attempt is made to use the details from more than one card, the second card could be barred from further use by the bank. Customers aren't warned of this, which is of particular concern just now, as so many phones are sold as Christmas gifts, and may initially be topped up by the donor. The "lucky" recipient of the phone may find his or her own card barred after trying to top up the phone later on. Thus, once again, Cellnet cause unnecessary inconvenience to the victims of their inadequate security, rather than adopting a proper interactive card registration system for legitimate users. The same feature carried three further articles critical of BT: for excessive "porting" charges when customers change cellular network; for people being removed from BT's Light User Scheme without warning if they also used another carrier (for example, for discounted overseas calls); and for BT charging for directory enquiry calls from phone boxes, after giving an undertaking not to do so when it ceased to provide paper directories. 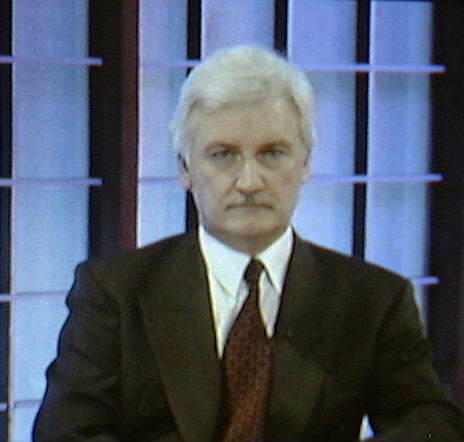 The Financial Times (5/9/2000) announced that Mr David McGlade is to succeed Peter Erskine as Managing Director of BT Cellnet, which, the paper says, "has had its share of critical press during the last few years". Hasn't it just? You can read some of it here. Mr McGlade read journalism and communications at Rutgers University, so, the FT comments, he "should be able to hold his own against Grub Street's finest". The Sunday Times of 13. August ("Money on the Net", page 4.7) ran a story about the power of consumer web sites, which was rather similar to the Guardian one, but with only an oblique reference to this campaign. The Guardian published an article on Thursday 3. August about the cost-effectiveness of individual web-based campaigns against corporate bad behaviour, and used ours at www.pardoes.com as its lead example. In the G2 section (page 14) Steve Gold gave the background to our campaign, and quoted the "Mr Angry" tag from the "Mobile News" article. You can read an electronic version of the article on the Guardian Unlimited website. The Daily Express published an article on 19. July ("Money", page 37) critical of both BT Cellnet and Vodafone for their poor security . The article, by Richard Dyson, was partly researched through this website, and also quoted John Cross, BT Cellnet's Head of Security, as saying that BT Cellnet is planning major security innovations. Excuse me, but haven't we heard that before... ...about 18 months before? Mr Cross also accuses credit card companies of being uncooperative, but APACS (to whom I wrote in July 1999) puts the blame on mobile phone companies, saying they should check addresses. Indeed they should, but Mr Cross has chosen not to. A correspondent reports that the BBC Radio WM consumer programme "The Ed Doolan Show" carried a piece on 27. July about a lady who keyed a digit wrongly into her pay-as-you-go Cellnet phone, and lost money as a result. My correspondent writes: "BT told her to [deleted] off and contact her card issuer, who also told her they could not help. A BT spokeswoman appeared on the programme with all kinds of excuses, but when pressed repeatedly by Ed Doolan, half agreed to consider some kind of recompense on an ex-gratia basis". More bad publicity for BT Cellnet as a direct result of our web campaign: the influential fortnightly trade magazine "Mobile News" published a second feature article on 26. June (p26) devoted to our web campaign, and quoting extensively from our pages. Stuart McWilliam interviewed Steve Pardoe and Mr John Cross, BT Cellnet's Head of Security. At 3½ illustrated A3 pages, it was the largest single item in the magazine. The first two pages covered this campaign, and the disgraceful way in which BT Cellnet treat their credit card fraud victims. A further page and a half gave John Cross a chance to respond. Steve Pardoe being interviewed for "Mobile News"
In my opinion, a number of the statements attributed to Mr Cross in the article are seriously misleading. The 6,250 named readers of "Mobile News" in the UK mobile communications industry can make up their own minds about which of us is telling the truth. 16. June: "Mobile News" published an article on 30. May devoted to our web campaign, and quoting (quite extensively, actually) from our pages. You can read extracts from both these articles on their own website, in their Archive section (search on "pardoe"). The new BBC1 prime - time consumer financial programme "Hard Cash" on 22. May featured BT Cellnet's credit card fraud scam, interviewing Steve Pardoe and Cellnet's Head of Security, John Cross (see below). "Cellnet is buckling under the strain of relentless consumer and media bombardments of its business practices and system performance. In the space of just one week, Cellnet was named and shamed on two national prime-time television shows, including BBC TV's consumer documentary program, "Watchdog." That report profiled the ordeal of one customer, Steve Pardoe, whose credit card was debited repeatedly without authorization by the carrier-�and he wasn't even a Cellnet customer". The BBC1 "Watchdog" consumer affairs programme on 17. February featured an interview with Mr John Cross, Cellnet's Head of Security, which was prompted by, and partly researched through, this website. Mr Cross was asked to explain Cellnet's continuing credit card fraud scandal, which is still going on, nearly a year after promises were made to the programme in March 1999 that the problem would be solved "within a fortnight". BT Cellnet and their PR firm, Fishburn Hedges, visited this site on 16. February, the day before transmission, and later in the week. Fishburn Hedges's visit was presumably to gauge the extent and detail of media exposure of Cellnet's fraud (though for some reason they didn't visit this Media Page), so as to help their client prepare a response to "Watchdog". They also downloaded my letter to John Cross, sent on 28. 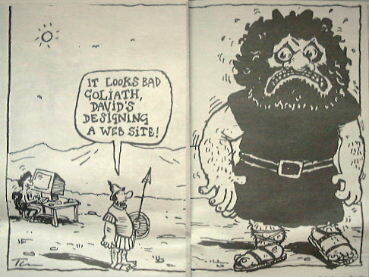 January and already visited on the Web by both Cellnet and BT, but to which no response has been received. This too was presumably so that Mr Cross could be primed on the issues raised, and on how to account for his decision to ignore my letter. Fishburn Hedges were back again on the day of transmission, for a good look round the site; and, rather bizarrely, at the weekend (including Sunday morning) using MS Proxy simply to download a few of our graphics icons, probably to complete local copies of our pages, having forgotten to get them earlier (when they were using Netscape 4.0, which doesn't save the graphics elements automatically). Ho hum. Apologies for the poor reproduction here 11. January 2000 : a new page commented on a second article in the Daily Telegraph (Page B3, "Money-go-round") of 18/12/1999 by Melanie Wright, which was based on telephone conversations with Steve Pardoe during the week. You can access a version of her article on the Electronic Telegraph website if you click here. Her previous article on phone fraud was published on Saturday 9. October, and should still be available here. This and our main Cellnet story pages were again visited by Deloitte & Touche, a Big 5 firm of Chartered Accountants, on Friday evening (3. December), so we know they are still interested. They'd previously read the material on Monday 27/9/1999, perhaps in connection with "Due Diligence" on the �3.15bn BT takeover. Our server log shows continuing traffic on this site, not only from direct visitors such as Government agencies, H.M. Customs & Excise (what's the VAT position on fraudulent credits?) and the "Parliament" server which MP's use; and BT, other cellular operators and phone manufacturers, and what one might call "interested parties"; but increasingly as a result of WWW search engine hits. This suggests that there is widespread interest in Cellnet's fraud story through word of mouth, as otherwise visitors would know the URLs of the pages already. The popular Alta Vista and Yahoo engines find our Pardoes Cellnet story pages as their #1 hit for a "cellnet fraud" enquiry, exposing their disgraceful activities to the entire world (we regularly get visits from overseas, particularly the USA). We are way ahead of any results from Cellnet themselves, with all their resources. More surprising are the unexpected search combinations that have resulted in recent visits: even "bt+cellnet+pre-pay+phones", "cellnet+easylife", "cellnet+pay+as+u+go", "cellnet+scam"... have led people to this site. What a wonderful PR machine! It must be depressing for BT Cellnet to learn that people simply looking for a phone find themselves reading about Cellnet's third-party fraud, and their shoddy behaviour regarding "free" calls, slow top-ups and passing off old phones as new, instead; and they are fast becoming the "consumer story of choice" in the broadcast media. This PR disaster arises simply because Cellnet took money from me, and then refused point blank to compensate me, apologise, or promise not to do it again. The following are some articles which have been drawn to our attention, and of which we have first hand knowledge or participation. There will of course be countless others. 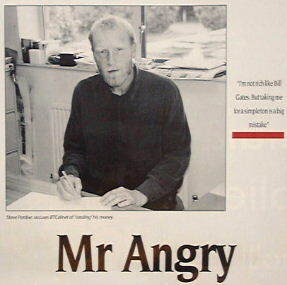 Demon Internet's "@Demon" magazine for their subscribers carried a piece on the Cellnet fraud, saying that BT Cellnet had finally moved to stop the fraud on its Pay As You Go pre-paid mobile phone packages. It pointed out that until recently BT Cellnet hadn't bothered to check for credit card fraud, enabling thieves to buy air time with just the information on a credit card. This meant that anyone could key a valid credit card number and expiry date into a Pay As You Go phone and continue to use it. BT Cellnet said the problem was now sorted out and blamed computer hitches for the long delay. Well, they would say that, wouldn't they? Thanks to my correspondent Steve Gray for passing this on. My brother spotted a piece in The Daily Telegraph on Saturday 9. October which confirmed my assertion that BT Cellnet have not kept their promise to fix the problem of fraudulent top-ups of their older "easylife" and "U" pre-pay phones. According to the Telegraph article1, only the new "Pay & Go" phones require registration before credit cards can be used to top them up (and there have, as is well known, been dreadful delays in getting this service up and running). 1The Telegraph author, Melanie Wright, has pointed out that her article didn't explicitly say this: the foregoing sentence is my interpretation of the difference between older phones already in use, not requiring registration, and the newer service, which now does. I'm happy to make this correction [14/12/1999]. In the article, Cellnet's line is that it is suffering from this fraud as a result of trying to make its system easy to use. In fact, of course, Cellnet's adoption of such a lax pre-pay model was a deliberate and cynical ploy to gain market share, at the expense of card holders who weren't even Cellnet customers. They were made aware of the consequences nearly a year ago, and it's a disgrace that they've done nothing to fix it. It's even more of a disgrace that they continue to mislead the media. You can see the same content at the Info-Sec website. ITV's "We Can Work It Out" consumer programme has featured BT Cellnet unfavourably in three of their recent programmes. That on 7. October merely referred to a duplicated phone number. The 30. September programme highlighted the problems customers are having in getting their "free" calls to a chosen number credited to their accounts. As has been remarked on before, it's disgraceful that BT Cellnet promote "free" calls, which actually have to be paid for immediately and are then credited several months in arrears, if at all. If Cellnet can't sort out a billing system which can cope with this in real time, they shouldn't promote the scheme. A more cynical view would be that Cellnet quite like having an interest free loan, and hope that most people either won't keep track of the "free" call credits, or will get fed up with trying to contact the help lines to complain and allow Cellnet to keep the money. The BT Cellnet Head of Corporate Communications, William Ostrom, who was put up to answer the programme's criticism was completely hopeless, and merely offered bland assertions that more operators were being recruited to handle the complaints. There was nothing in the way of a constructive apology or offer of compensation, and no evidence that the cause of the problem, Cellnet's insecure billing system, was being fixed. I missed the 23. September show, featuring the chaos of their credit card pre-pay system, but the Leeds studio have kindly sent me a review tape. The programme was covering the familiar ground of disgruntled customers who've bought pre-pay phones and then suffered unreasonable delays in crediting top-ups (interestingly, whether by voucher or by credit card). Although the feature was initiated by research into Cellnet's third-party fraud, which of course led them to this web site, there was no reference to fraud in the programme, as Cellnet were by then assuring everyone that the problem had been solved. The BBC Radio 4 "You and Yours" programme again featured Cellnet's fraud on Thursday 30. September. The Daily Mail published an article on Wednesday 25. August reporting on Cellnet's credit card fraud. BT Cellnet spokesman Damien Peachey was quoted as admitting that the company had been aware of the potential for fraud since the spring. The company insisted that "tough new restrictions" would be in place by the end of the month. The article stated that this type of fraud had risen from �10 million in 1997 to �13.8 million last year. The BBC Radio 5 Live programme "5 Live Report" on Sunday 22. August reported on telephone fraud after coming across this site during web research, and the presenter, David Cook, recorded an interview with Steve Pardoe. You can download an .mp3 audio file of the programme from the BBC's website. Birmingham's popular Sunday Mercury newspaper of 8. August published a front page article on the Cellnet fraud scandal, continued with a photo of Steve Pardoe on Page 3, and a leading article on Page 18. On 2. August, ThisIsLondon (the Evening Standard) ran another Cellnet story, with news of a glitch on Pay As You Go payments, where customers trying to update credit by credit card were unable to do so. I have had the same report first-hand from a correspondent today. If this is a side-effect of Cellnet's claimed "improved security", it might give grounds for optimism, but only if it actually leads to a cessation of this endemic fraud. 29. July 1999: a correspondent on the uk.telecom.mobile user group kindly pointed me to an article in ThisIsLondon, referring to the Cellnet fraud problem. The server log shows that our "You and Yours" page has been popular among the media and telecomms readership. Cellnet's lawyers, Lovell White Durrant, called back on Friday 16. July for a look at the main story page. Gentlemen, if you find anything here which is inaccurate (as opposed to just not liking to see your clients' behaviour exposed in the public domain) please e-mail me immediately, and I shall be happy to issue a correction. However, literally thousands of people (many of them experts in the industry) have visited these pages, and I'm pretty confident that any errors would have been pointed out by now. All the correspondence I have received so far supports what I'm saying, without exception, nor has any of it been materially challenged on the Internet user groups. So, Cellnet can brief their lawyers about me, read my story, take my money (three times), and fob me off; but they still can't apologise, compensate me or tell the truth. Or, indeed, modify their cynically insecure payment systems. It would be pathetic, if it were not so serious. On 6. 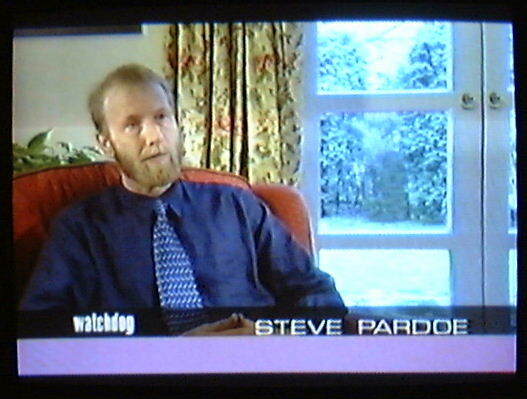 July, BBC Radio 4's "You and Yours"consumer affairs programme broadcast a recorded telephone interview with Steve Pardoe. Cellnet put up a PR spokesman, Dave Massey, whose disingenuous and even untruthful replies typified Cellnet's cavalier and cynical approach to the fraud problem which they have deliberately introduced, and have still failed to address, acknowledge or apologise for. These phones are still on sale, and indeed BT Cellnet boast of the huge number they've already sold (over a million since July 1998) and about the security of which they appear to be doing absolutely nothing. Want to deny this? E-mail me. The Independent newspaper ran articles by their Technology Editor, Charles Arthur, on 1. March and again on 30. June ("Cellnet scam loophole remains unplugged"). Both of his articles followed conversations with Steve Pardoe: in the second, he quotes me, and also reports that the Association for Payment Clearing Services described Cellnet's system as "an encouragement to fraud" and "unacceptable". I've written a letter to APACS but had no reply. I have spoken to Barclaycard to ask for their reaction to this. I've been asked not to report it just yet, but watch this space. The consumer magazine "Which?" also published an article criticising Cellnet in the summer, after a student found illegal charges on her card account. "Which?" 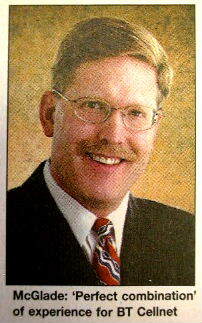 were an early visitor to this web site, but it took them some time to get the story into print. Image © BBC TV BBC1's "Watchdog" TV programme ran my story as the lead item on Thursday 11. March. An interview was filmed at my home. Cellnet were invited to put up a spokesman, but declined at the last minute, offering instead a cynical and disingenuous PR Response. You can also visit the BBC's synopsis of the programme. There was an immediate flurry of e-mail traffic and visits to our website. No doubt Cellnet's competitors were having a good laugh, but other, more official bodies, may not have found it all quite so amusing. The matter was raised again on Watchdog on 25. March: Cellnet had not kept their promise to make their pre-pay system secure, and had not given a date when they would do so. Since the story broke, I have heard of people having several hundred pounds, and in one case over �1000, illegally taken from their credit card accounts by Cellnet. Watchdog have run three other stories regarding Cellnet's disgraceful business practices, which included their passing off old phones as new, delays in crediting "free" calls, and problems in cancelling contracts. You can access them from the BBC's stories page (go to "Computers and Communication"). You can still click on this link to read a précis of the appalling story, or return to our Cellnet intro page. The other material remains available on request.